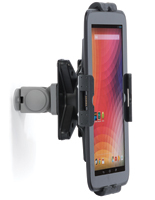 Need an Android or Apple® device stand that takes up as little space as possible? 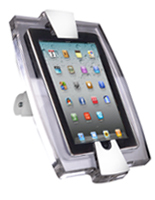 Our iPad wall mount displays come in a variety of configurations to meet any commercial, professional, or retail display purpose. Each enclosure affixes to vertical surfaces to maximize available floor space in stores, schools, restaurants and even homes. 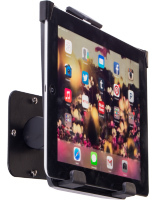 iPad wall mounts are available in an assortment of sizes and styles to accommodate different touchscreens and display environments. 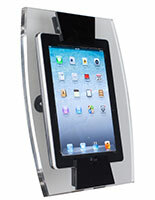 In addition, each bracket features a modern finish of white, black or silver that blends into any interior. 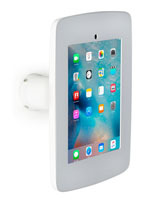 An iPad wall mount, also known as an interactive tablet holder, will attract customers with its eye level, easy to access screen. Versatile accessories like these have a variety of applications for commercial, professional, institutional and personal or residential use. 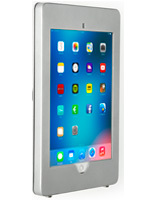 What kind of uses benefit from vertically installed Apple® tablets? 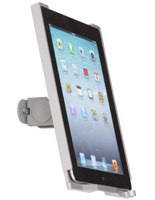 iPad wall mounts are popular for use as check-out fixtures in retail environments. Instead of a cash register, employees can use a tablet holder to complete transactions. 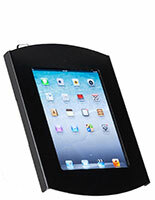 Alternatively, customers can use the Square reader to purchase merchandise with their credit or debit card. Eye-height tablet displays allow business and store customers to easily find and access custom merchandising apps or sales information. Digital catalogs allow visitors to search merchandise and find related products effortlessly. 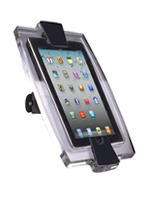 These space-saving tablet display brackets are ideal for clearing floor space in high traffic areas. High security public touchscreen enclosures are a great choice for installation in malls, airports, transit stations, concourses and other locations with long corridors, as well as lobbies and atria, can make use of public touchscreens. 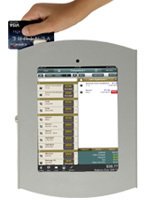 General and wayfinding information, maps, stores, and points of interest are all marketed using this type of interactive kiosk. 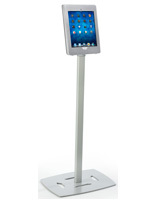 Wall-mounted self-service tablet stands allow restaurants, diners and bistros to present ordering stations, jukebox controllers and media players at individual tables without reducing available dining space. 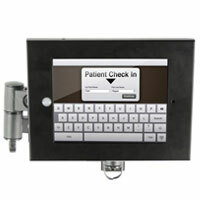 In addition, this type of holder can allow patrons to sign in to a waitlist during busy hours or place their own order in advance. Interactive touchscreen stations at museums and galleries frequently replace hand-carried self-guided players. These personalized tour information kiosks are an economical alternative to printed or audio-only tours and are easily mounted on brackets throughout an exhibit. 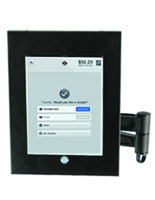 End-cap and showroom tablet fixtures allow grocery store, bookstore, and other retail store customers to look up item information, stock quantities or recipes using foods from nearby sections. Wall mount lobby kiosks are a great choice for lobby and corporate entry installations. Businesses and non-profits can place these in their lobby to present clients with pictures, slideshows, video and interactive apps for information and wayfinding use. 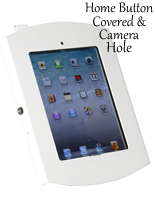 These wall mount Apple & Androic device enclosures are made of durable steel, aluminum and plastic that will last for years. Their neutral color complements any environment, from commercial to hospitality to professional and public access. 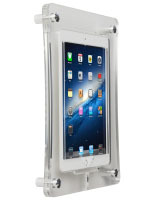 Each case can include an assortment of features to meet the needs of any environment or users. What options are available for the touchscreen displays? Adjustable models can rotate for portrait or landscape orientation. Switching easily between alignments allows the devices to accommodate the widest possible variety of content images and designs. 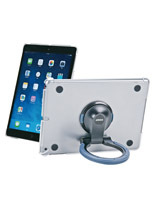 Locking wall mounts protect valuable devices from theft. This added security allows businesses and institutions to safely showcase their interactive fixture without the fear of damage, tampering or theft. In addition to key locking cases, these sturdy enclosures are made from steel and aluminum to withstand heavy use in commercial traffic. 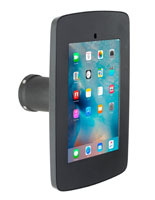 For mounts that do not include an integrated lock, we offer anti-theft systems such as Kensington security cables. Hanging brackets feature a rubber ring hanger that doubles as a stand. If needed, these accessories can also be used on countertops. Units with mounting arms are great for their ability to rotate, tilt and swivel. This type of kiosk is ideal for almost any environment because it can adjust to accommodate different positions. 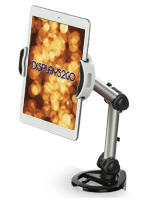 A mounted arm will allow customers to move the touchscreen around without being able to remove it from the frame. 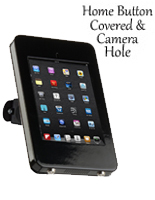 Camera, charging port and audio jack access — or restriction — is important in a number of different uses. 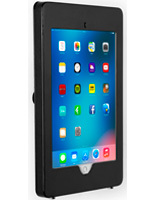 Allowing customers free use of these options lets them take pictures, use card readers and listen through headphones while the device is encased. 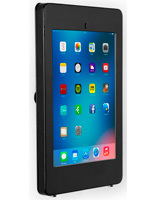 Tablets can be plugged in while in use to remain powered all day. Alternatively, restricting access eliminates unauthorized program access or tampering. 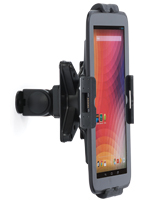 There are no almost limits the selection of apps on the market that will complement this type of mount. Software can be found for restaurant waitlists, store checkout counters, staff coordination, time clocks, e-mail sign ups, surveys and much more. Shop and business owners can give customers information, increase productivity and marketing capabilities with hundreds of useful apps. 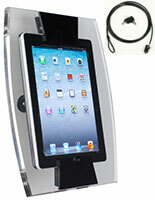 Residential users and students can take advantage of hands free operation in almost any environment. Buy a versatile mounted case and take advantage of our same day shipping and wholesale prices!